If you haven’t mastered the art of canning yet (I haven’t) then this refrigerator jam is for you. I use frozen berries here because fresh are a little pricey in the Midwest this time of year. Thaw, rinse, & drain berries. Place a saucer in the freezer for later. Combine berries, sugar, and lemon juice in bowl and mix well. Leave out at room temp. stirring occasionally for two hours. Transfer mixture to saucepan & bring to a boil over medium heat, stirring to prevent burning. Mash to thick puree then reduce to medium heat and gently boil for about 20 minutes or until the mixture starts to thicken & stirring often. Remove from heat to test jam for gelling point. Drop a teaspoon full onto the saucer from the freezer and place back into the freezer for about a minute. Test by pushing the jam with your finger. If it is ready, it will wrinkle on the surface. Cook a few minutes longer if it fails to do this and test again until it gels. 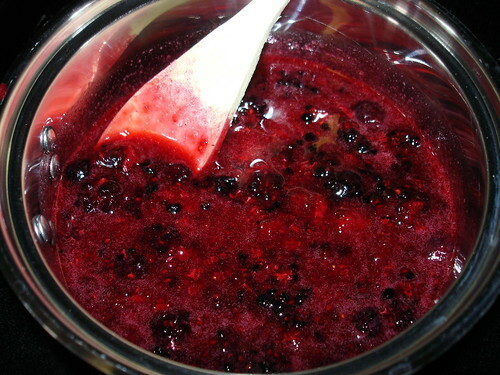 When ready, ladle jam into a clean jar. Place in refrigerator when cool. Jam will last about 2 weeks in the refrigerator.